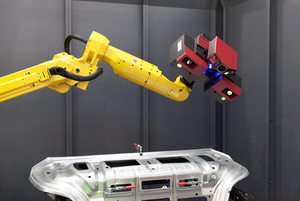 Optical 3D coordinate measuring machines are replacing tactile measuring machines and gauges in many areas of industry. They capture quality information about an object that is more detailed and easier to interpret, and they do it in a much shorter measuring time. Modern sensors are being used in many industries for the inspection of components such as sheet metal, tools and moulds, turbine blades, prototypes and injection moulded and pressure cast parts. For the optical scan, the projection unit works in combination with two cameras. During measurement, precise stripe images are projected onto the surface of the object and recorded by both cameras on the stereo camera principle. This stripe image is generated using a compact Phytron stepper motor optimised for smooth running. In addition, Phytron solves the problem of the high-precision assembly a customized drive element for their customers and thus once again provides a perfect fit – which is not just intended to save space.